When I was first introduced to this greeting I was told that it means, “I see God within you.” Today I researched a little more, and the consensus seems to be that the literal translation is “Bow Me You” or “I bow to you.” However the connotation is that of reverence for a higher being within that other person and a place within each of us where we become as one being when we go there. I will synthesize my understanding of Namaste and say, when I greet you in this way it means that I see a higher power, the creator, within you and when you go to that place in yourself and I go to that place within me we are no longer individuals but we become parts of a great universal being that is working to bring Peace, Love and security to all. Thus, when we become individual parts of a whole being our differences become as cogs on a gear that mesh together to work towards transferring energy to the whole of humanity. In this way we can celebrate our uniqueness as much as our unity of purpose. Our diverse methods serve to reach a common goal. Our individual hues blend to form a beautiful garden. Our divergent functions serve to get the whole job done. When I greet you with the word, “Namaste,” or if I put my hands together an bow in the Namaste gesture it means I recognize the potential within us to work together for the betterment of humanity. The beauty of it is that no words need to be spoken. The simple little bow is all that is needed to convey the message. It is universal. It belongs to no one culture, religion, race or social class. All can turn to the world in a gesture of Namaste and all can work together in peace to bring about a secure planet were all will have the opportunity to make it a home we can be proud of. Namaste to all who read this. Take it and pass it on. Another meaning I came across in my research is, “not mine, but yours.” This it is a giving up of the ego and submitting to the will of another. When we understand that the other is the higher power that dwells within, it really means giving up our own will for that of God. In the first chapter of Genesis we read, “So God created man in his own image, in the image of God created he him; male and female created he them.” Thus we see that Christian and Jew agree that the Image of God is within us. We also see in the 13th Hidden Word from those revealed by Bahá’u’lláh in Arabic that God is found within ourselves. The idea that we are made in God’s image and that we have a divine nature within us seems to be universal, and so the greeting, “Namaste,” is universal. Having started in India, it is now branching out to the world. 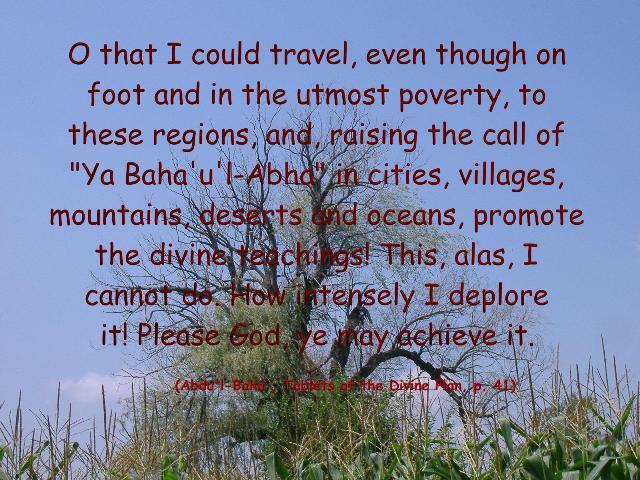 O that I could travel, even though on foot and in the utmost poverty, to these regions, and, raising the call of "Ya Baha'u'l-Abha" in cities, villages, mountains, deserts and oceans, promote the divine teachings! This, alas, I cannot do. How intensely I deplore it! Please God, ye may achieve it. One of my hopes and goals is to fulfill this wish of ‘Abdu’l-Bahá’s and raise this call wherever I can. Namaste is a greeting which recognizes God within us. Allah-u-Abha or Ya Baha'u'l-Abha expresses the Greatness of God. 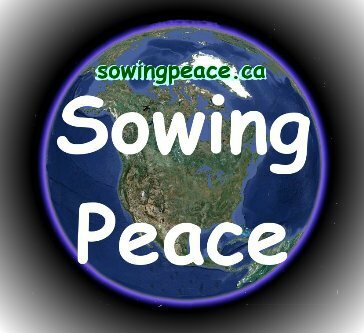 Whichever greeting I use or whatever call I raise it is in the hope of bringing peace, security and well being to all the people of the world. Namaste to all who have landed here. I would love to learn who you are and what your thoughts are. Please leave me a comment.